Worried about finding a job when you graduate from beauty school? #4. Start doing research before you graduate. You don’t have to wait until you’ve graduated and passed your licensure exam before you start setting the groundwork for getting a job. In fact, doing a little bit of research before you graduate could make a huge difference in your ability to land the right job. Take some time to get to know the local salons in your area, including the managers and owners of those salons. It could also be beneficial to get an entry-level job at one of those salons as a receptionist or an assistant to the stylists. Not only will this help you get your foot in the door, you’ll also have the opportunity to learn from different stylists, which will help you fine-tune your own skills. #5. Put together a portfolio. When you’re first starting out in your cosmetology career, your resume probably won’t be all that impressive. Additionally, every single person who applies will provide the salon with a resume, so how do you set yourself apart from all of the other applicants? One of the best ways is by providing a portfolio of your work with your resume. While you might not have a lot of experience on paper, providing a potential employer with your portfolio will show them exactly what you can do. Whether you provide them with a print version of your portfolio or a digital one, make sure to include high-quality images that show a variety of different styles, models and services that you can provide. They say a picture is worth 1,000 words, and never has this been truer than when you’re applying for a beauty career! #6. Sign up for a professional cosmetology organization. 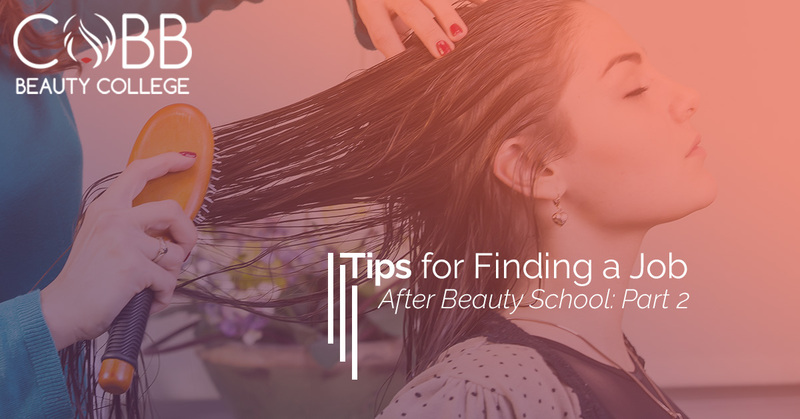 There are several professional organizations within the cosmetology industry that help schools, students, educators and professionals connect. There are many different organizations out there that allow you to network and make new contacts within the industry, and one of the best ways to get your name out there with local salon managers and owners is to sign up for one yourself. If you are currently attending beauty school, we hope that these tips will help you land your dream job! But if you’re still looking for the right beauty college in Kennesaw, or you’re still determining if a career in cosmetology is right for you, contact us at Cobb Beauty College today! ©2018 Cobb Beauty College. Do not copy. All rights reserved.